Black holes have been the subject of research for decades. With Albert Einstein expanding on Newtonian Physics, the prediction of a black hole became a theoretical idea. The difficulty in detecting a black hole is that by its very nature, light is not emitted or reflected. As a result, viewing a black hole is not possible. Stellar evolution helps us to know where to look, and some indirect methods have been introduced to study this elusive object. To understand black holes, a brief introduction into a stars lifetime is necessary. To understand why it is not possible to see a black hole, a brief introduction into gravity is necessary. Our current methods of observation and our growing knowledge of stellar evolution are expanding rapidly, however the possibility of detecting a black hole directly may not be possible. We can, however, improve our knowledge of the effects of a black hole through evolving observational methods. What is a Black Hole and where does it come from? Everyone is familiar with Sir Isaac Newton. Among many things, he was responsible for the Laws of Gravitation. George Michell, a clergyman in 1783, speculated that since light behaves like particles as indicated by Sir Isaac Newton, then light would be influenced by gravity. If a star were 500 times larger than the sun, light could not escape (Ostlie, page 661). This star, called Michell’s star, will later be called a black hole. The name is somewhat confusing since there is not really a hole (or so we think); a black hole gets its name by the theory that light is pulled back, leaving behind an object that emits or reflects nothing. While black holes are certainly a theoretical void, they do have a beginning as a high mass star. Within our galaxy (and other galaxies) are billions of stars, all with various mass and luminosity. 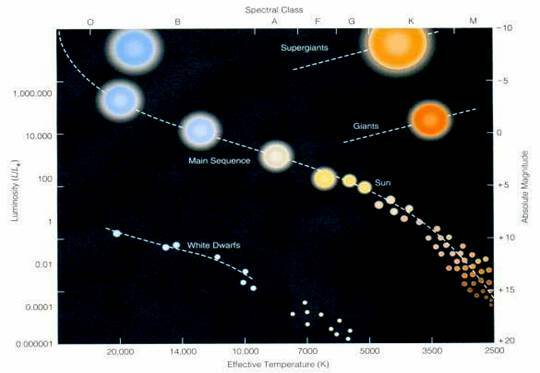 When placed on a graph called a Hertzsprung-Russell (H-R) diagram, a logical sequence reveals itself. Stars follow a particular pattern when ending their life and everything depends on mass. Our Sun, which is considered an “average” star, is the point of reference. We know by studying an H-R diagram that our Sun will end its life shedding its layers leaving behind a planetary nebula (Freedman, page 504). (Chart adapted from Freedman, page 519). Stars will end their lives with a compact object called a corpse. Looking at the chart above, we can see the end result of a star based on mass (there are special, but rare circumstances that a star can completely blow itself apart without leaving a compact object). The largest of stars end their life collapsing so fast that it seems to overcome the barriers introduced by quantum physics. The result is an object that creates such gravity that space-time is altered so light cannot escape. While Newtonian Physics work well for us on Earth, Albert Einstein introduced the General Theory of Relativity expanding on Newtonian Physics to accommodate objects in space. The issue of gravity is adjusted to include space-time (Ostlie, page 633 to 637). While this may sound complex, an analogy of space-time is a rubber sheet representing space. Objects that contain mass cause a depression on this rubber sheet - the more massive the object, the deeper the depression. An object traveling near a depression will have its path altered or bent – like our orbit around the Sun, which is considered traveling in a straight line through the curve of space. Based on this theory, a black hole creates an infinite depression that any object caught will forever spiral into nothing – or at least into the very center of a black hole called a singularity (Ostlie, page 663). The discussion on singularities is beyond the scope of this paper, and will summarily be ignored. All objects (with the exception of black holes) emit some form of electromagnetic radiation. We are most familiar with visible light. When something is heated to a very high temperature, emission of x-rays is possible. In fact, if the temperature of an object reaches at least 107 Kelvin, x-ray emissions are detectable (Kutner, page 337). The Einstein X-Ray Observatory, launched in 1978, discovered a strong x-ray source emanating from a binary star system in the constellation Cygnus. To confirm this, radio observations also agree with the pattern of variability emanating from this source (Kutner, page 216). The optical counterpart is shown to be, based on spectroscopic data, a blue supergiant star, or an O9 type star. This pair is considered a spectroscopic binary, and careful study has revealed the companion to be 8 solar masses (Kutner, page 217). With an object so small and so massive, the conclusion is that the companion is possibly a black hole. With nearly half of all stars in the Universe being binary or multiple star systems, it may seem that there would be more candidates, but detecting black holes is harder than it seems. For any interaction between a pair of stars, the system must be considered a close binary pair. This means that the gravitational domain of each star, called the Roche Lobe, must either be in contact with each other or overlap each other (Freedman, page 493). With an object like a black hole in a close binary system, the intense gravity literally feeds off of the accompanying star. The gas from the companion star is pulled in by the black hole and the angular momentum of the gas results in an accretion disk that is heated to intense levels by compression near the edge of the black hole (called the event horizon) to produce a very strong source of x-rays (Ostlie, page 672). These x-ray sources are not very common, and there are other sources of x-rays from binary systems from neutron stars which can also emanate x-rays using the same mechanism as the black hole; however, there is a difference in intensity that allows the determination of the source. The mass of the unseen object leads to a differentiation between a neutron star and a black hole. Currently there are two very strong black hole candidates from a binary system – Cygnus X-1 and LMCX-3, an x-ray source in the Large Magellanic Cloud (Kutner, page 217). How can one star remain a supergiant while the other evolved quickly into a black hole? The answer is simply, the black hole was a supergiant star much larger and much hotter than its companion, and its stages of evolution occurred more rapidly. Close binary star systems containing a supergiant counterpart are not the only location for a possible black hole; scientists have found an M class star with an unseen companion with a mass of 3.97 solar masses. With the appearance of occasional x-ray bursts, it is concluded this may be a black hole [R8]. The search for black holes are not limited to binary star systems. There is a growing field of study of supermassive black holes that appear to reside in the centers of every galaxy. The Hubble Space Telescope imaged the center of galaxy M87, and discovered a very bright source with a jet of material emanating at incredible speeds. It is calculated that the mass of this area is 3 x 109 solar masses (Freedman, page 551). While x-ray jets have been studied in distant galaxies with the x-ray material moving at velocities near the speed of light [R3], not all supermassive black holes emit copious amounts of x-rays. In the center of our own galaxy, an invisible source known as Sagittarius A seems to be the focal point of our galaxy. What makes this spot special is that stars near this region seem to orbit this spot at incredible speed. By calculating the effects on the surrounding stars, it is concluded that this unseen object has a diameter of 1 A.U. with a mass of 3 million Suns (Freedman, page 582). Further evidence of this supermassive black hole is given by its ability to consume a star. On May 9, 2003, a group of European astronomers studying Sagittarius A witness a star being devoured by the supermassive black hole [R6]. In the Perseus A galaxy cluster, galaxy designation NGC 1275 has at its center a candidate of a supermassive black hole. Emanating from the center, in addition to copious x-rays, are what may be pressure waves. These waves seem to emanate in a pattern of a sound, B-flat to be specific. These sound waves are said to be 57 octaves below middle-C [R4]. There is also a growing interest is what is called intermediate-mass black holes. This supposed ‘missing link’ between stellar black holes and supermassive black holes are thought to reside at the core of globular clusters [R5]. The data is still being accumulated. The very successful XMM-Newton orbiting x-ray observatory is locating more black hole candidate x-ray sources similar to Cygnus X-1. Ten candidates within the Andromeda Galaxy have been documented by the XMM-Newton (http://www.spaceflightnow.com/news/n0403/29blackhole/). Black holes that seem to hide within the material of its companion star have also been detected by x-ray and gamma ray detection telescopes [R7]. Our current observational ability has revealed a number of indirect methods of detecting these elusive objects. With the growing list of potential black hole candidates, one thing is certain: a black hole is certainly beyond a theoretic idea and a real object that exists in our Universe. With improved x-ray and gamma ray telescopes introduced into orbit around Earth, the list of candidates is sure to grow. We may not be able to see a black hole, but we can certainly learn a great deal from the effects of a black hole. Further understanding of these elusive objects will no doubt add to our knowledge of stellar evolution, and maybe even add to our understanding the dynamics of galactic formation. The future is indeed a very exciting one. Until then, let the research continue. [R2] Hawking, Stephen. The Universe in a Nutshell. New York: Bantam Books, November 2001. [R3] P.L.G. AstroNews. “Jets from a Black Hole.” Astronomy Magazine January 2003: 26 – 49. [R4] MacRobert, Alan. “Sound from a Black Hole.” Sky and Telescope December 2003: 18 - 19. [R5] Nadis, Steve. “Black Holes in the Middle.” Astronomy Magazine March 2004: 36 – 41. [R6] Whitt, Kelly K. “The Last Goodbye.” Astronomy Magazine February 2004: 28. [R7] Netting, Jessa F. “Black Holes that Hide.” Astronomy Magazine February 2004: 32. [R8] R.B. News 04. “Is the smallest black hole known?” Astronomy Magazine April 2004: 25. [R9] Ostlie, Dale A., and Bradley W. Carroll. Modern Stellar Astrophysics. Massachusetts: Addison-Wesley Publishing Company, 1996. [R10] Kutner, Marc L. Astronomy: A Physical Perspective. Cambridge: Cambridge University Press, 2003. The term black hole was first used by John Archibald Wheeler (Hawking, page 113). A white dwarf resides in the center of a planetary nebula. Red Giants are main sequence stars (like our Sun), that begin to burn Helium when the Hydrogen in the core runs out. A White Dwarf cannot exceed a solar mass of 1.4. This is called the Chandrasekhar Limit (Freedman, page 507). In White Dwarfs for example, the Chandrasekhar Limit obeys the Pauli Exclusion Principle – no two electrons can exist in the same quantum state (Freedman, page 484). A Super-Giant star collapse still obeys the Pauli Exclusion Principle, but rapid contraction forces electrons and protons to form neutrons, which makes up a Neutron Star (Kutner, page 197). That is 100,000,000 Kelvin. For comparison, our Sun has a surface temperature of 5800 Kelvin. Our atmosphere does not allow the passage of X-rays, so telescopes sensitive to X-rays must be placed in orbit around the Earth. Our Sun is a G type star. Following the pattern O B A F G K M, an M class star is smaller than our Sun. Unlike a supergiant star, there is not as much mass for the black hole to consume so x-ray emission will be less. Incredible speed is a relative term in astronomy. What usually takes centuries occurs in years is considered an incredible speed. A.U. is astronomical units measured by the Earth-Sun distance. 1 A.U. = 93 million miles.